HomeGoogle Ranking FactorTop 10 Google Ranking Factor For Beginners. Do you want to know how to rank a website on google or Google Ranking Factor. 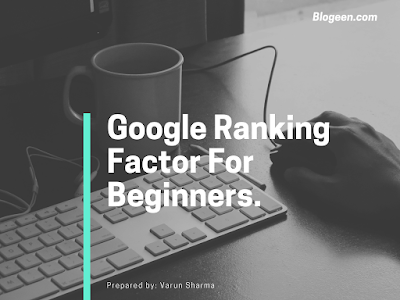 So hello everyone my name is Varun Sharma and today I am going to tell you about Top 10 Google Ranking Factor For Beginners.Famous Term of the Internet world is : Google Ranking Factors, if Google officially announces it then maybe everyone will be able to do this. But google has not officially given any such list in this topic. All Blogger and business owner want to see their product at # 1 Position in SERP (Search Engine Page Result), due to this, he does follow SEO Tutorial. Google has not officially shared any information about this rank factor yet. But if you also work in the SEO field for a few days then you will understand how Google sees a link in # 1. In today's post we will learn about these same SEO Optimization. Today the number of websites, blogs and bloggers is increasing day by day. All businessmen are six to do their business online. Bloggers want to earn money online. Some people are supporting Website for Personal Profile. Some are making a professional online resume. After the Blog / Website they want Google SERP First Position Because of this, demand for SEO Professional is increasing, so some people also want to learn SEO. I am planning SEO Tutorial, SEO Case Study and SEO Services Related Website. Very soon it will be live. When one attains success at successive stages of success, there are some attitudes in it. He does not have time. His friends say you have changed. Its main reason is to get the responsibility with success, which has to be given more time than ever before. Perhaps you have understood what I am saying. Today's date is Google Number 1 Search Engine. Many people are associated with Trust, which they do not want to break. But on the other hand, all want to see my content in Top, I want my content. For this reason, some parameters have been fixed, now whatever the parameter will meet, the number 1. There is more than 200 Trillion Web Page Save in Google's database so far. Search checks more than 200 Factors. But I am going to tell about the most popular Top 10 Google Ranking Factor here. 1. If the top Level Domain Name is the first Word Keyword. 2. In the subdomain, be the keyword. 1. Clean and attractive design is important for website ranking. 2. Who does not like the coolest showroom and decorative walls with floor lighting. 3. The online store should be the same. 1. Google has clearly stated in New Update that the Website is Mobile Optimized. 2. Mobile Responsive means the layout of the website is changed according to the screen of the device. 3. About 65% are Internet User Mobile Users. So it is very important to have Mobile Website Optimized. 2. Visitors and search engines both look at the post title. 3.Try writing a Blog Post Title from the keyword itself. 4. Top ranking keywords are highlighted by post title filter in search engine. So that website Ranking is decided. 5. Use Keyword in the Description Tag. 5. Use Keyword in the URL too. 6. If you are using keywords in the post, try using keywords in the post title too. Keyword Density is the number of times Keyword used in the Post. Google Employee told Google Search Convention that Google has no meaning with Keyword density. But if a Word is used multiple times it is considered spam. 7.Density of Main Keyword should be maximum 4%. 8. Many use heading and subheading in post. It is better to keep these headings in an order. H1 to H6 Use in Keyword Bold or Italic font. 1. Sitemap is very important to connect a website to Google Algorithm. 2. Basically it is a file, which lists all the pages of the website. 3. Sitemap file is submitted to Google Webmaster. 1. The short form of Domain Authority is DA. PA's full form is Page Authority. 2. It is very important for DA and PA to be good for SERP rank. 3. Until a few years ago, SERP Position was fixed with google pagerank. But now it was done with DA and PA.
4. Backlink and On Page SEO improvements are essential for DA and PA Improve. 1. Time, death and customer does not wait for anyone. 2. Visitors have many options. So check website load time from website speed test. 3. Recently google has also launched the google page speed tool. 4. There are also many site speed test tools available besides google page speed. 5. Hear or know about Pingdom tools. With the help of this can also test website speed. 6. The SERP Ranking is as good as the Page Speed to correct. 1. About Content Length, many blogs have a minimum 700 to 800 word post. 2. That's right. But if the content is unique and quality content and it is understood in 500 words it will also run. 1. Copy Paste will not do at all. 2. Taking an idea from someone's post is not wrong, but it is wrong to print a Dito. 3. Making Google fooled is not that easy. 4. Use Canonical Tag to avoid internal duplicate content. 2. Overall content is everything. 3. Try writing High Quality and Unique Content. 4. User is always looking for quality and quality. 5. Do not write things down in post to increase post length. 6. While writing a post, just keep in mind the User, not the Search Engine. Since there is no Search Engine Reader. 7. Happy Reader Happy Search Engine. Conclusion:- Hey friends hope you will like our this post (Top 10 Google Ranking Factor For Beginners). Friends you can share your experience with blogging with us by commenting and if you have any type of question then you can comment we will surely reply you and find out your solution. How to Create a Sitemap in WordPress. How To Earn Money From Instagram? Earn Money Online.